Welcome to Catalogue #212, October 2018. Back at the sharp end after gingaing around in North America. My swollen legs have now returned to human shape and the compression sox discarded. Thank you Silver Chain, great work. And Jo’s broken hand has also healed and her splint is off. Just in time for the summer. Here is a list of nearly 300 titles many of which I ‘ve listed and many which are old favourites destined to make list after list especially unit histories. 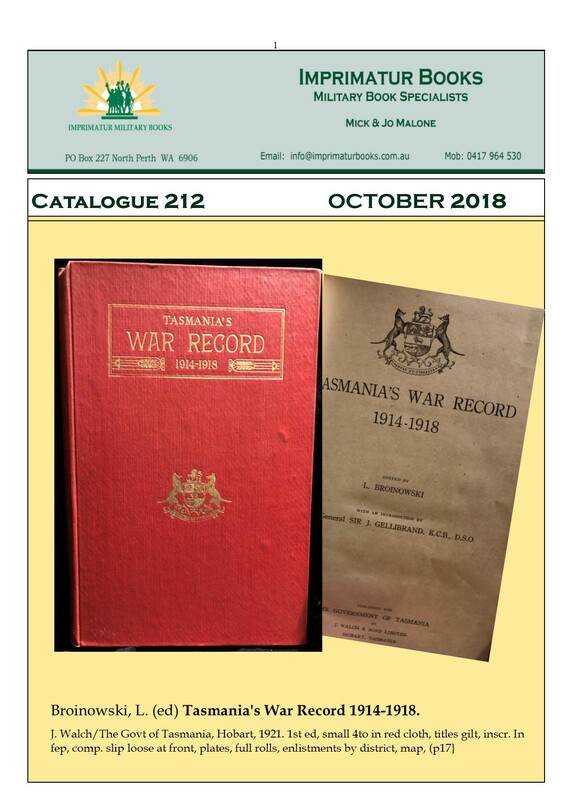 The special book on the cover this month is the highly sought after and regarded ‘TASMANIA’S WAR RECORD 1914-1918’. (#215) It’s a book in remarkable condition having been published in 1921. It contains a full muster (nominal) roll (incl ranks on discharge) AND a full list of ‘district enlistments’, one of the very few histories to have this. Of the 12,907 men to have embarked from Tasmania 2,432 were KIA or DOW. Also a list of decorations (incl 11 VCs). John Burridge reprinted this book decades ago and for many years that was the only edition I ever saw. Now I have a pristine original! How good is that? As usual I dedicate this list to soldiers past and present who have given their all for the people of Australia. We are eternally indebted to them. We are always on standby for those needing a leg up.